We, as a community, are too evolved to be simple. We complicate many things which are Simple. One of my friends wrote on Facebook few days back – “Trying to figure out whether the marginal utility of the next shot increases or decreases.” At times this marginal analysis becomes a problem in our life. We think too much about the outcomes and benefits of taking an action rather than taking the action. I believe life is indeed very simple. I have observed struggles of families living on the Footpath of Mumbai. I always wondered the tough life for them. It is another thing that we may talk about them encroaching on footpath and so on, which actually results in few death once in a while, when some people – when drunk returning home from late night parties – drive over the footpath dwellers. What surprised me lately was, observing a few kids playing on footpath. The kids were happy, playing with discarded polythene. They do not have toys or an Android (Akash) etc to play. They are enjoying their life, dancing on the footpath. At times they are wearing something, many a times nothing. But they were happy. Also, their families (parents / uncles) were happy smiling with the kids. I started thinking – how often we get such time to enjoy with our family?A typical young parent is struggling in office long hours during the week. Do we have time? In Mumbai I travel about 2 hours one way (my stupidity if not Mumbai on the wrong side), how much time and energy I am left with to be at home and just relax? Think of someone who has kids and traveling so much daily. Does he/she have time to be with the kid as I say the footpath family has? For the footpath family life is simple. They enjoy life with whatever they have. I thought that they do not think so much, they do not do a lot of marginal analysis. They take decisions with whatever “limited” options and resources they have. 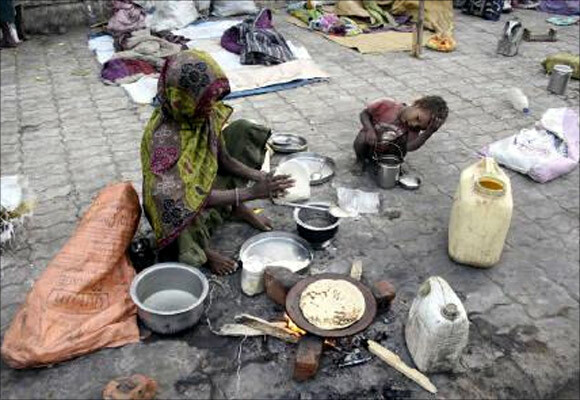 They do not own few Mercs and don’t eat in five star hotels, they do not hide behind big words such as inflation, GDP and “we do not need to worry when rupee is sliding!” These people are just working on daily wages not having a proper shelter, yet I have seen the smile with their kids, happy in whatever they have. Most precious thing they have is Time. Time to spend few peaceful minutes with kids though on a footpath. We do a lot of marginal analysis – if I buy a Honda Amaze worth X amount and Y liter mileage. Is it going to be a good decision over a Mahinda Quonto worth A amount and B liter mileage.Than what is the maintenance cost and this and that and whatever and parking place. EMI per month, expense per month. Utility of the vehicle over the cost of the vehicle. I feel we have made progress. Alas! we have made ourselves miserable. We need some introspection.